You want to teach beginning sounds to the kids in your class? Here’s one way to do it. Share these things that start with y cards with them. 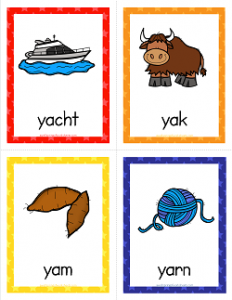 There are eight cards with these words: yacht, yak, yam, yarn, yellow, yo-yo, yogurt, and yolk. The colorful pictures will help the kids remember what the words say. Look out for double trouble! The word yo-yo has the y and therefore the /y/ sound two times!